Kashering–making something kosher–can be difficult, and–because of the liberal use of boiling water, highly heated appliances, and blowtorches–dangerous. In addition to offering advice, many rabbis would be happy come over and assist you in kashering your kitchen. Reprinted with permission from How to Keep Kosher (HarperCollins). There are many kinds of cooktops, from standard gas and electric to futuristic radiant heat with a glass-ceramic surface. 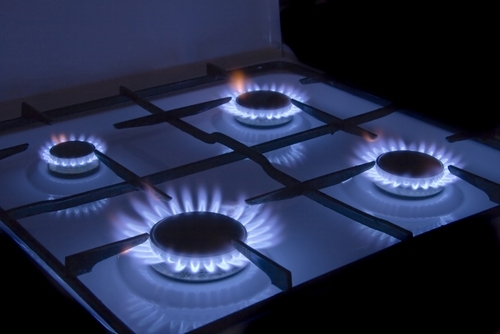 Gas cooktops generally consist of the pilot burner, a hinged cooktop, metal plates around each burner, and grates, or “spiders,” that rest on those grates. Electric cook-tops are similar, but without the grating, as pots and pans rest directly on the heating coil. Let the cooktop rest, unused, for 24 hours. Remove all the burner grates and plates and wash thoroughly. Scorn the stovetop. If possible, lift the stovetop and clean underneath. I’ve been amazed at the amount of food that seems to escape into the seamy underside of my gas stovetop. Make sure to clean temperature setting dials as well. Once all the separate parts are cleaned, reassemble your stovetop. Once the cooktop is cleaned thoroughly and reassembled, turn each burner on high. Check with your rabbi as to the amount of time the burner should remain on. One Orthodox rabbi I spoke with said 15 minutes was sufficient–you want those iron grates or the electric coils to get red hot. According to Conservative tradition, the burners should remain on for 45 minutes. Some Orthodox rabbis say the gas cooktop iron grates may be kashered when you kasher your oven . You can put them in the oven during the self-cleaning process, although you may want to check with the manufacturer that this won’t cause damage. In order to ensure that the area immediately surrounding the burners is adequately heated and kashered, one Orthodox rabbi I spoke with recommends placing a blech on top of the heating burners. A blech is a metal tin, shaped like an inverted cookie pan [or just a flat sheet of metal], which you place on top of the burners to dissipate the heat if you leave the stove on dur­ing Shabbat. When you see the blech glowing faintly red (most visible with the lights turned off), the burners are kashered (and so is the blech). Alternately, cover the burner areas with heavy-duty aluminum foil or a double layer of regular foil. If you have a metal cooktop, this space is kasherable with a blowtorch (best done by a rabbi familiar with kashering with blowtorches). Some Orthodox and Conservative rabbis say that irui may be used [infusion, in which boiling water is poured over the area]. Enameled cooktops cannot be kashered, according to Or­thodox tenets, although the burners are acceptable to use. If you have a fan above the cooktop, it needs to be cleaned thoroughly, but not kash­ered in any particular way, as you are not using it for direct food preparation. The same stovetop can be used for both meat and dairy cooking; however, rabbis recommend not cooking meat and dairy at the same time, or at least not directly next to one another. Steam from one pot can rise and mingle with steam from the second pot, thereby affecting the flavor of the food cooking in each pot. Smooth glass cooktops can be tricky to kasher, as it is difficult to heat adequately the entire area that a large pan might touch without damaging the surface of the cooktop. Ac­cording to Orthodox halakhah [Jewish law], glassware that is heated needs to be kashered through very high heat, which may damage the cooktop. According to Conservative rules, it does not need such kashering; it is enough to wash the glass cooktop with soap and water. To kasher an oven, remove the racks, scrub them clean, and scrub clean the walls, ceil­ing, and floor of the oven. Let it sit, unused, for 24 hours. Some Orthodox rab­bis say it is sufficient to clean and heat the oven as high as possible for an hour, or to run the oven through a self-cleaning cycle if that is an option; others feel that the heat of a blowtorch is necessary to kasher an oven effectively. A rabbi will blowtorch the racks and sides of the oven. From the Conservative stand, cleaning the oven, letting it sit unused for 24 hours, and then running it through the self-cleaning cycle, or leaving it on high heat for 45 minutes, is the acceptable way to kasher an oven. Actual oven use can be tricky, and the stricter observers strongly recommend separate ovens for meat and dairy. Again, this is not an option for many people, so there is some leniency in this matter. When you use your oven, you cannot cook meat and dairy dishes at the same time be­cause the flavors of one can permeate the flavors of the other. A more mahmir [strict] Ortho­dox stand is that an oven has one “gender,” say, for example, meat. If you want to cook dairy in that oven, then you need to cover the racks with aluminum foil. Ideally, you should cover the top of the pan with aluminum foil as well, but that may not be an option for items such as cakes or cookies. In such a case, make sure the oven is thoroughly cleaned and kashered. A more mekil [lenient] stand is that the oven may be used for either meat or dairy, but should be thoroughly cleaned between uses. The Conservative stand is that an oven may be used, but separately, for both meat and dairy cooking.